LeBron had a triple-double in Game 5, but there's no discounting a fourth quarter unworthy of a king. DALLAS -- LeBron James had a good game. Seventeen points, 10 rebounds and 10 assists. Perfectly fine, respectable production. I’d give him a solid B-plus. This is LeBron James. The most talented player in the entire league. The guy who went to Miami specifically for these moments. The guy who said early Thursday, on his Twitter account, that it was “Now or Never.” The guy playing in the biggest game of his career to date. 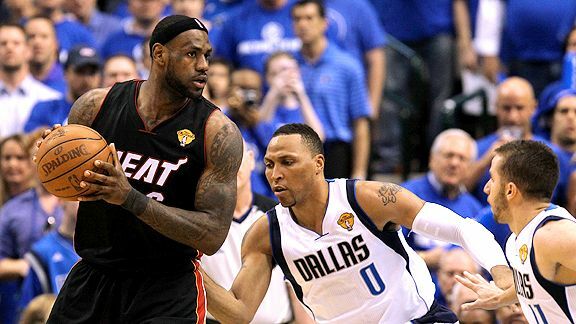 With the Mavs knocking down crazy shots and the Heat responding in kind for three quarters Thursday, it was a classic situation for King James to come through with a finishing flourish, put his foot on Dallas’ throat and take the series back to Miami for the clincher. Instead, for the fourth game in a row, King James was merely a viscount. Miami had a four-point lead with 4:37 left; from there, James missed two jumpers, committed an offensive foul and was beaten for two 3-pointers by Jason Terry. Granted, the second of those was a borderline miraculous shot, and the offensive foul call just as easily could have been a basket-and-one. And like I said, he had a pretty good game overall for almost any other NBA player. Just not for LeBron James. He made some nice passes, setting up three fourth-quarter layups that gave Miami its short-lived lead, and had a great contest on Shawn Marion in transition. On the other hand, he declined to take over when Dwyane Wade was out with a hip injury for the first seven minutes of the third quarter, taking three shots in 7:30. He rarely attacked when the Heat repeatedly posted him up through the first three quarters. And while he was more assertive in the fourth quarter than in Game 4’s debacle, he wasn’t any more effective. James had a triple-double, but his two points in the final stanza came on a basket that was basically conceded to him, after Terry’s game-clinching triple at the other end. Overall, he scored 17 points but needed 46 minutes to do it. The average NBA player this season, per 46 minutes, scored 18.9 points. He shot 8-of-19 without a single 3-pointer. That’s not good for anybody, let alone a player of this talent. He had two free throw attempts. TWO. This continued a series-long trend of James being either unable or unwilling to attack the rim -- he has only 16 free throw attempts for the series. He has 11 fourth-quarter points in five games, despite playing every minute of every fourth quarter. Eleven points in 60 minutes. That’s a wee bit south of superstar territory. Actually, it’s a wee bit south of Juwan Howard territory -- he averaged 14 points per 60 minutes this season. Every Miami player except Joel Anthony scored at a higher rate. Again, this isn’t just any random guy. This is a two-time MVP who was the most coveted free agent in NBA history. This is one of the best players of all time, regardless of what happens in the next few days. This is the reason the Heat had a championship parade last July ... because when they got LeBron, they got the promise of dominating games like this one. This is the part where the typical writer reflex is to ascribe this problem to some failing of his character; I’m not going there. Certainly, James has succeeded in such situations before -- witness his one-man annihilation of Detroit in 2007 or his valiant conference finals series against Orlando in 2009 or his destruction of Chicago’s top-rated defense that happened, um, all of three weeks ago. So I don’t know why he’s been incapable of summoning such efforts in this series against what, on paper, is a very beatable Dallas defense. And I’m not informed enough to speculate. For posterity’s sake, I’ll also note that you can’t just pin this on LeBron. When the other team shoots 13-of-19 on 3s -- many of them crazy, pull-up, off-the-dribble tries -- the normal response is to kindly tip your hat and head to the airport. It’s also not his fault that Mike Bibby keeps being allowed on the court or that Anthony can’t catch a cold or that his teammates had 14 turnovers. But we knew Miami had these problems going in. And we thought the Heat would prevail anyway, because they had LeBron. Even with the Mavs hitting crazy shots, Miami would have won if the LeBron we expected had shown up. James’ subpar offensive efficiency is the main differentiator in the box score. It’s a recurrent theme: James is averaging 17.2 points and 3.2 free throw attempts in the Finals -- that’s nice. He averaged 25.8 and 8.8, respectively, against Chicago -- that’s awesome. And right now, that’s the difference. LeBron being good isn’t good enough. Miami needs great, and it's not getting it. With King James, the Heat will still win this series. But if Viscount James keeps showing up, they’re dead meat.